The standard circulating coinage of the United Kingdom is denominated in pounds sterling (symbol "£"), and, since the introduction of the two-pound coin in 1994 (to celebrate the 300th anniversary of the Bank of England 1694–1994), ranges in value from one penny to two pounds. Since decimalisation, on 15 February 1971, the pound has been divided into 100 (new) pence. From the 16th century until decimalisation, the pound was divided into 20 shillings, each of 12 (old) pence. British coins are minted by the Royal Mint in Llantrisant, Wales. The Royal Mint also commissions the coins' designs. As of 31 March 2016,[needs update] there were an estimated 30.14 billion coins circulating in the United Kingdom. The first decimal coins were circulated in 1968. These were the five pence (5p) and ten pence (10p), and had values of one shilling (1/-) and two shillings (2/-), respectively, under the pre-decimal £sd system. The decimal coins are minted in copper-plated steel (previously bronze), nickel-plated steel, cupronickel and nickel-brass. The two-pound coins, and, as from 28 March 2017 the new one-pound coins, are bimetallic. The coins are discs, except for the twenty pence and fifty pence pieces, both of which have faces that are heptagonal curves of constant width, and the new one-pound coins, which have faces with 12 sides. All the circulating coins have an effigy of Queen Elizabeth II on the obverse, and various national and regional designs, and the denomination, on the reverse. The circulating coins, excepting the two-pound coin, were redesigned in 2008, keeping the sizes and compositions unchanged, but introducing reverse designs that each depict a part of the Royal Shield of Arms and form (most of) the whole shield when they are placed together in the appropriate arrangement (see photo). The exception, the 2008 one-pound coin, depicts the entire shield of arms on the reverse. All current coins carry a Latin inscription whose full form is ELIZABETH II DEI GRATIA REGINA FIDEI DEFENSATRIX, meaning "Elizabeth II, by the grace of God, Queen and Defender of the Faith". In addition to the circulating coinage, the UK also mints commemorative decimal coins (crowns) in the denomination of five pounds. Prior to decimalisation, the denomination of special commemorative coins was five shillings, that is, ​1⁄4 of a pound. Crowns, therefore, had a face value of 25p from decimalisation until 1981, when the last 25p crown was struck. Ceremonial Maundy money and bullion coinage of gold sovereigns, half sovereigns, and gold and silver Britannia coins are also produced. Some territories outside the United Kingdom, which use the pound sterling, produce their own coinage, with the same denominations and specifications as the UK coinage but with local designs. In the years just before decimalisation, the circulating British coins were the half crown (2/6, withdrawn 1 January 1970), two shillings or florin (2/-), shilling (1/-), sixpence (6d), threepence (3d), penny (1d) and halfpenny (​1⁄2d). The farthing (​1⁄4d) had been withdrawn in 1960. There was also the Crown (5/-), which was, and still is legal tender, worth 25p, but normally did not circulate. The history of the Royal Mint stretches back to AD 886. For many centuries production was in London, initially at the Tower of London, and then at premises nearby in Tower Hill in what is today known as Royal Mint Court. In the 1970s production was transferred to Llantrisant in South Wales. Historically Scotland and England had separate coinage; the last Scottish coins were struck in 1709 shortly after union with England. Coins were originally hand-hammered — an ancient technique in which two dies are struck together with a blank coin between them. This was the traditional method of manufacturing coins in the Western world from the classical Greek era onwards, in contrast with Asia, where coins were traditionally cast. Milled (that is, machine-made) coins were produced first during the reign of Elizabeth I (1558–1603) and periodically during the subsequent reigns of James I and Charles I, but there was initially opposition to mechanisation from the moneyers, who ensured that most coins continued to be produced by hammering. All British coins produced since 1662 have been milled. The English penny first appeared in Anglo-Saxon times, as a silver coin. It was derived from another silver coin, the sceat, of 20 troy grains weight, which was in general circulation in Europe during the Middle Ages. The weight of the English penny was fixed at ​22 1⁄2 troy grains (about 1.46 grams) by Offa of Mercia, an 8th-century contemporary of Charlemagne. The coin's designated value, however, was that of 24 troy grains of silver (one pennyweight, or ​1⁄240 of a troy pound, or about 1.56 grams), with the difference being a premium attached by virtue of the minting into coins. Thus, 240 pennyweights made one troy pound of silver in weight, and the monetary value of 240 pennies also became known as a "pound". (240 actual pennies, however, weighed only 5400 troy grains, known as tower pound, a unit used only by mints. The tower pound was abolished in the 16th century.) The silver penny remained the primary unit of coinage for about 500 years. By 1915, a penny was worth around one-sixth what it had been worth during the Middle Ages. British government sources suggest that prices have risen over 61-fold since 1914, so a medieval sterling silver penny might have had purchasing power equivalent to £4.50 today[when? ], and a farthing (a quarter penny) would have the value of slightly more than today's[when?] pound (about £1.125). From the time of Charlemagne until the 12th century, the silver currency of England was made from the highest purity silver available. But there were disadvantages to minting currency of fine silver, notably the level of wear it suffered, and the ease with which coins could be "clipped", or trimmed. During the reign of Henry VIII, the silver content was gradually debased, reaching a low of one-third silver. However, in Edward VI's reign, silver purity was increased to sterling again and the first crowns and half-crowns were produced dated 1551. From this point onwards till 1920, sterling was the rule. As a result of a report written by Newton on 21 September 1717 to the Lords Commissioners of His Majesty's Treasury the bimetallic relationship between gold coins and silver coins was changed by Royal proclamation on 22 December 1717, forbidding the exchange of gold guineas for more than 21 silver shillings. Due to differing valuations in other European countries this unintentionally resulted in a silver shortage, as silver coins were used to pay for imports, while exports were paid for in gold, effectively moving Britain from the silver standard to its first gold standard, rather than the bimetallic standard implied by the proclamation. In 1920, the silver content of all British coins was reduced from 92.5% to 50%, with some of the remainder consisting of manganese, which caused the coins to tarnish to a very dark colour after they had been in circulation for long. Silver was eliminated altogether in 1947, except for Maundy coinage, which returned to the pre-1920 92.5% silver composition. The 1816 weight/value ratio and size system survived the debasement of silver in 1920, and the adoption of token coins of cupronickel in 1947. It even persisted after decimalisation for those coins which had equivalents and continued to be minted with their values in new pence. The UK finally abandoned it in 1992 when smaller, more convenient, "silver" coins were introduced. There was a small quirk in this alternating pattern when Edward VIII became king in January 1936 and was portrayed facing left, the same as his predecessor George V. This was because Edward thought his left to be his best side. However, Edward VIII abdicated in December 1936 and his coins were never put into general circulation. When George VI came to the throne, he had his coins struck with him facing the left, as if Edward VIII's coins had faced right (as they should have done according to tradition). Thus, in a timeline of circulating British coins, George V and VI's coins both feature left-facing portraits, although they follow directly chronologically. All genuine UK coins are produced by the Royal Mint. The same coinage is used across the United Kingdom: unlike banknotes, local issues of coins are not produced for different parts of the UK. The pound coin until 2016 was produced in regional designs, but these circulate equally in all parts of the UK (see UK designs, below). An extensive coinage redesign was commissioned by the Royal Mint in 2005, and new designs were gradually introduced into the circulating British coinage from summer 2008. The pre-2008 coins will remain legal tender and are expected to stay in circulation for the foreseeable future (except for the £1 coin). The first decimal coins – the five pence (5p) and ten pence (10p) — were introduced in 1968 in the run-up to decimalisation in order to familiarise the public with the new system. These initially circulated alongside the pre-decimal coinage and had the same size and value as the existing one shilling and two shilling coins respectively. The fifty pence (50p) coin followed in 1969, replacing the old ten shilling note. The remaining decimal coins – at the time, the half penny (​1⁄2p), penny (1p) and two pence (2p) — were issued in 1971 at decimalisation. A quarter-penny coin, to be struck in aluminium, was proposed at the time decimalisation was being planned, but was never minted. In the years since decimalisation, a number of changes have been made to the coinage. The twenty pence (20p) coin was introduced in 1982 to fill the gap between the 10p and 50p coins. The pound coin (£1) was introduced in 1983 to replace the Bank of England £1 banknote which was discontinued in 1984 (although the Scottish banks continued producing them for some time afterwards; the last of them, the Royal Bank of Scotland £1 note, is still in production as of 2013[ref]). The designs on the one pound coin change annually in a largely five-year cycle. The decimal half penny coin was demonetised in 1984 as its value was by then too small to be useful. The pre-decimal sixpence, shilling and two shilling coins, which had continued to circulate alongside the decimal coinage with values of ​2 1⁄2p, 5p and 10p respectively, were finally withdrawn in 1980, 1990 and 1993 respectively. However, the double florin and crown with values of 20p and 25p respectively have not been withdrawn. In the 1990s, the Royal Mint reduced the sizes of the 5p, 10p, and 50p coins. As a consequence, the oldest 5p coins in circulation date from 1990, the oldest 10p coins from 1992 and the oldest 50p coins come from 1997. Since 1997, many special commemorative designs of 50p have been issued. Some of these are found fairly frequently in circulation and some are rare. They are all legal tender. The specifications and dates of introduction of the 5p, 10p, and 50p coins refer to the current versions. These coins were originally issued in larger sizes in 1968 and 1969 respectively. With their high copper content (97%), the intrinsic value of pre-1992 1p and 2p coins increased with the surge in metal prices of the mid-2000s, until by 2006 the coins would, if melted down, have been worth about 50% more than their face value. (To do this, however, would be illegal, and they would have had to be melted in huge quantities, using quite a bit of energy, to achieve significant gain.) In later years, the price of copper fell considerably. Copper plated steel coins were introduced to replace them. There are also commemorative issues of crowns. Before 1990, these had a face value of twenty-five pence (25p), equivalent to the five shilling crown used in pre-decimal Britain. However, in 1990 crowns were redenominated with a face value of five pounds (£5) as the previous value was considered not sufficient for such a high-status coin. The size and weight of the coin remained exactly the same. Decimal crowns are generally not found in circulation as their market value is likely to be higher than their face value, but they remain legal tender. The major design feature was the introduction of a reverse design shared across six coins (1p, 2p, 5p, 10p, 20p, 50p), that can be pieced together to form an image of the Royal Shield. This was the first time a coin design had been featured across multiple coins in this way. Completing the set, the new £1 reverse features the Shield in its entirety. The effigy of the Queen, by Ian Rank-Broadley, continued to appear on the obverse of all the coins until 2015 when it was replaced by the fifth and latest portrait, designed by Jody Clark. As of 2012, 5p and 10p coins have been issued in nickel-plated steel, and much of the remaining cupronickel types withdrawn, in order to retrieve more expensive metals. The new coins are 11% thicker to maintain the same weight. There are heightened nickel allergy concerns over the new coins. Studies commissioned by the Royal Mint found no increased discharge of nickel from the coins when immersed in artificial sweat. However, an independent study found that the friction from handling results in four times as much nickel exposure as from the older-style coins. Sweden already plans to desist from using nickel in coins from 2015. In 2016, the £1 coin design was changed from a round single metal design to a 12 sided bi-metal design, with a slightly larger diameter. Half penny (​1⁄2p; £0.005) 1971–1984, demonetised since then. * The specifications and dates of introduction of the 5p, 10p, and 50p coins refer to the current versions. These coins were originally issued in larger sizes in 1968 and 1969 respectively. †This coin was originally issued in a smaller size in a single metal in 1986 for special issues only. It was redesigned as a bi-metallic issue for general circulation in 1997. The following are commemorative issues and are seldom encountered in normal circulation due to their precious metal content. The following decimal coins have been withdrawn from circulation and have ceased to be legal tender. * The specifications and dates of 5p, 10p, and 50p coins refer to the larger sizes issued in 1968 and 1969 respectively. † The specification refers to the round coin issued from 1983–2016. Although obsolete, this coin is still redeemable at banks and still legal tender on the Isle of Man. All current coins carry a Latin inscription whose full form is ELIZABETH II DEI GRATIA REGINA FIDEI DEFENSATRIX, meaning "Elizabeth II, by the grace of God, Queen and Defender of the Faith". 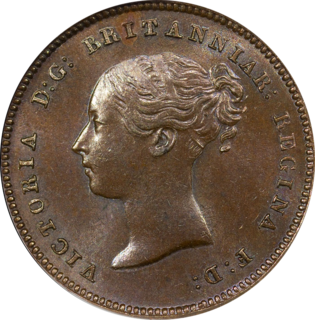 The inscription appears on the coins in any of several abbreviated forms, typically ELIZABETH II D G REG F D.
From 2008, the circle of dots between the lettering and the rim was removed from the 1p, 2p, 5, and 10p and £1. It was never on the 20p and 50p, and is retained on the £2. ​1⁄2p (discontinued 1984) — A crown, symbolising the monarch. 50p – Britannia and lion. Up until the 2008 redesign, the reverse designs of the one pound coin have followed a five-year cycle. This cycle successively represents, by using royal heraldic badges, each of the four constituent countries of the United Kingdom, namely Scotland, Wales, Northern Ireland and England, with the Royal Coat of Arms used in every fifth year. From 2008 until 2016, a single design based on the Royal Coat of Arms was issued every year, with additional designs representing the nations issued sporadically. 2015: Royal Coat of Arms Heraldic beasts 2016: A unicorn (for Scotland), a dragon (for Wales), an Irish elk (for Northern Ireland) and a lion (for England). 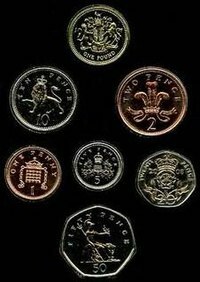 The 1p, 2p, 5p, 10p, 20p and 50p coin designs post 2008 each depicts a part of the Royal Shield, and form the whole shield when they are placed together in the appropriate arrangement. The Royal Shield is seen in its entirety on the £1 coin. Outside the United Kingdom, the British Crown Dependencies of Jersey and Guernsey use the pound sterling as their currencies. However, they produce local issues of coinage in the same denominations and specifications, but with different designs. These circulate freely alongside UK coinage and English, Northern Irish, and Scottish banknotes within these territories, but must be converted in order to be used in the UK. The island of Alderney also produces occasional commemorative coins. 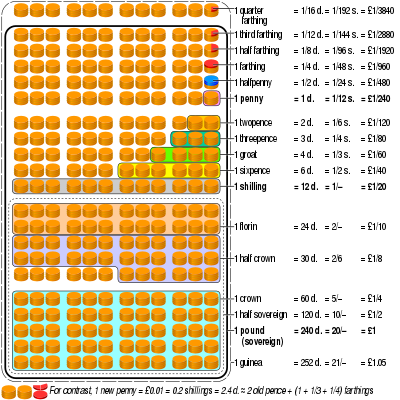 (See coins of the Jersey pound, coins of the Guernsey pound, and Alderney pound for details.). The Isle of Man is a unique case among the Crown Dependencies, issuing its own currency, the Manx pound. While the Isle of Man recognises the Pound Sterling as a secondary currency, coins of the Manx pound are not legal tender in the UK. Between 1987 and 2012 a series of bullion coins, the Britannia, was issued, containing 1-troy-ounce (31 g), 1⁄2-troy-ounce (16 g), 1⁄4-troy-ounce (7.8 g), and 1⁄10-troy-ounce (3.1 g) of fine gold at a millesimal fineness of 916 (22 carat) and with face values of £100, £50, £25, and £10. Since 2013 Britannia bullion contains 1-troy-ounce (31 g) of fine gold at a millesimal fineness of 999 (24 carat). Between 1997 and 2012 silver bullion coins have also been produced under the name “Britannias”. The alloy used was Britannia silver (millesimal fineness 958). The silver coins were available in 1-troy-ounce (31 g), 1⁄2-troy-ounce (16 g), 1⁄4-troy-ounce (7.8 g), and 1⁄10-troy-ounce (3.1 g) sizes. Since 2013 the alloy used is silver at a (millesimal fineness 999). In 2016 the Royal Mint launched a series of 10 Queen's Beasts bullion coins, one for each beast available in both gold and silver. A similar pre-decimal system operated in France, also based on the Roman currency, consisting of the livre (L), sol or sou (s) and denier (d). Until 1816 another similar system was used in the Netherlands, consisting of the gulden (G), stuiver (s; ​1⁄20 G) and duit, (d; ​1⁄8 s or ​1⁄160 G). The farthing (​1⁄4d) had been demonetised on 1 January 1961, while the crown (5/-) was issued periodically as a commemorative coin but rarely found in circulation. The crown, half crown, florin, shilling, and sixpence were cupronickel coins (in historical times silver or silver alloy); the penny, halfpenny, and farthing were bronze; and the threepence was a twelve-sided nickel-brass coin (historically it was a small silver coin). Some of the pre-decimalisation coins with exact decimal equivalent values continued in use after 1971 alongside the new coins, albeit with new names (the shilling became equivalent to the 5p coin, with the florin equating to 10p), and the others were withdrawn almost immediately. The use of florins and shillings as legal tender in this way ended in 1991 and 1993 when the 5p and 10p coins were replaced with smaller versions. Indeed, while pre-decimalisation shillings were used as 5p coins, for a while after decimalisation many people continued to call the new 5p coin a shilling, since it remained ​1⁄20 of a pound, but was now counted as 5p (five new pence) instead of 12d (twelve old pennies). The pre-decimalisation sixpence, also known as a sixpenny bit or sixpenny piece, was equivalent to ​2 1⁄2p, but was demonetised in 1980. The introduction of decimal currency caused a new casual usage to emerge, where any value in pence is spoken using the suffix pee: e.g. "twenty-three pee" or, in the early years, "two-and-a-half pee" rather than the previous "tuppence-ha'penny". Amounts over a pound are normally spoken thus: "five pounds forty". A value with less than ten pence over the pound is sometimes spoken like this: "one pound and a penny", "three pounds and fourpence". The slang term "bit" has almost disappeared from use completely, although in Scotland a fifty pence is sometimes referred to as a "ten bob bit". Decimal denomination coins are generally described using the terms piece or coin, for example, "a fifty-pee piece", a "ten-pence coin". A ​1 1⁄2d coin was circulated in Jamaica in the nineteenth century. Jamaicans referred to the coin as a "quatty". In 1983, the Royal Mint mistakenly produced some two pence pieces with the old wording "New Pence" on the reverse (tails) side, when the design had been changed from 1982 to "Two Pence". In June 2009, the Royal Mint estimated that between 50,000 and 200,000 dateless 20 pence coins had entered circulation, the first undated British coin to enter circulation in more than 300 years. It resulted from the accidental combination of old and new face tooling in a production batch, creating what is known as a mule, following the 2008 redesign which moved the date from the reverse (tails) to the obverse (heads) side. From a very early date, British coins have been inscribed with the name of the ruler of the kingdom in which they were produced, and a longer or shorter title, always in Latin; among the earliest distinctive English coins are the silver pennies of Offa of Mercia, which were inscribed with the legend OFFA REX "King Offa". As the legends became longer, words in the inscriptions were often abbreviated so that they could fit on the coin; identical legends have often been abbreviated in different ways depending upon the size and decoration of the coin. Inscriptions which go around the edge of the coin generally have started at the center of the top edge and proceeded in a clockwise direction. A very lengthy legend would be continued on the reverse side of the coin. All but Edward III and both Elizabeths use Latinised names (which would have been EDWARDUS and ELIZABETHA respectively). EDWARD DEI GRA REX ANGL Z FRANC D HYB(E) "Edward III, by the grace of God King of England and France, Lord of Ireland." EDWARD DEI GRA REX ANGL DNS HYB Z ACQ "Edward, by the grace of God King of England, Lord of Ireland and Aquitaine." This version was used after the Treaty of Brétigny (1360) when Edward III temporarily gave up his claim to the French throne. EDWARD DEI G REX ANG Z FRA DNS HYB Z ACT "Edward, by the grace of God King of England and France, Lord of Ireland and Aquitaine." This version was used after Anglo-French relations broke down and Edward III resumed his claim. GEORGIUS III DEI GRATIA BRITANNIARUM REX FIDEI DEFENSOR "George III, by the Grace of God, of the Britains King, Defender of the Faith." 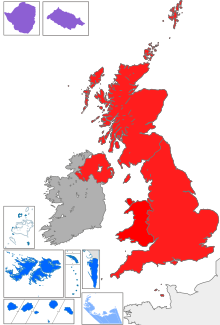 By the Acts of Union 1800, Ireland was united with Great Britain into a single kingdom, which is represented on the coinage by the Latin genitive plural Britanniarum "of the Britains" (often abbreviated BRITT), signifying "the United Kingdoms of England, Scotland, and Ireland". At the same time, the United Kingdom abandoned the traditional claim to the throne of France, which had become a Republic, and the other titles were dropped from the coinage. POSUI DEUM ADIUTOREM MEUM "I have made God my helper". Coins of Henry VII, Henry VIII, Elizabeth I. Possibly refers to Psalm 52:7, Ecce homo qui non posuit Deum adjutorem suum "Behold the man who did not make God his helper". EXURGAT DEUS DISSIPENTUR INIMICI "May God rise up, may [his] enemies be scattered". Coins of Charles I, during the Civil War. Refers to Psalm 67:1 in the Vulgate Bible (Psalm 68 in English Bible numbering). ^ "United Kingdom £5 Coin (Commemorative Crown)". The Royal Mint Limited. 3 March 2010. Archived from the original on 18 April 2009. ^ "Coins – Collector Gold & Silver Coins & Limited Edition Gifts – The Royal Mint". The Royal Mint. Archived from the original on 10 February 2005. ^ "Llantrisant". Royal Mint. 2012. Archived from the original on 16 November 2011. Retrieved 28 January 2012. In April 1967 it was announced that the new Royal Mint would be built at Llantrisant in South Wales. ^ "National Museums of Scotland – Balance and scales (detail)". Archived from the original on 9 April 2009. ^ On the Value of Gold and Silver in European Currencies and the Consequences on the World-wide Gold- and Silver-Trade Archived 28 January 2017 at the Wayback Machine, Sir Isaac Newton, 21 September 1717. ^ "Rare Edward VIII coin showing profile of monarch's 'better side' goes on display". BT.com. Retrieved 13 January 2019. ^ "Mintage Figures". The Royal Mint. Archived from the original on 17 May 2013. ^ "I hate the new coins. My father must be turning in his grave". The Independent. UK. 6 April 2008. Archived from the original on 15 September 2009. Retrieved 15 September 2009. ^ "Make Way for Britain's New Coin Designs". Archived from the original on 14 July 2011. Retrieved 17 May 2008. ^ "Cupro Nickel Replacement Programme". Archived from the original on 21 April 2013. Retrieved 1 September 2014. ^ "Treasury 'should foot coin change bill'". BBC News. 5 November 2011. Archived from the original on 5 November 2011. Retrieved 5 November 2011. ^ Anna Lacey (22 June 2013). "A bad penny? New coins and nickel allergy". BBC Health Check. Archived from the original on 7 August 2013. Retrieved 25 July 2013. ^ "The New £1 Coin Is Here – Nationwide". www.nationwide.co.uk. Archived from the original on 9 May 2018. Retrieved 9 May 2018. ^ "New 12-sided pound coin to enter circulation in March". BBC News. 1 January 2017. Archived from the original on 31 March 2017. Retrieved 29 March 2017. ^ "One Penny Coin". The Royal Mint. Archived from the original on 30 August 2009. ^ The Fifth Definitive Coinage Portrait First Edition Archived 3 March 2015 at the Wayback Machine Royal Mint (www.royalmint.com). Retrieved on 2015-03-03. ^ The Royal Arms 1-pound coin Archived 3 April 2015 at the Wayback Machine Royal Mint (www.royalmint.com). Retrieved on 10 January 2016. ^ Blog: The 2016 UK coin designs revealed Archived 13 January 2016 at Wikiwix Royal Mint (www.royalmint.com). Retrieved on 10 January 2016. ^ "Foreign and Commonwealth Office country profiles: South Georgia and the South Sandwich Islands". fco.gov.uk. Archived from the original on 22 April 2009. Retrieved 9 May 2018. ^ "Foreign and Commonwealth Office country profiles: British Antarctic Territory". fco.gov.uk. Archived from the original on 21 November 2008. Retrieved 9 May 2018. ^ "Foreign and Commonwealth Office country profiles: Tristan da Cunha". fco.gov.uk. Archived from the original on 30 June 2010. Retrieved 9 May 2018. ^ "Government of South Georgia & the South Sandwich Islands". Archived from the original on 12 November 2002. ^ "Oxford Dictionaries – Dictionary, Thesaurus, & Grammar". Archived from the original on 29 March 2007. ^ ""bob or two" – Google Search". ^ Chalmers, Robert (1893). A History of Currency in the British Colonies. London, UK: Her Majesty's Stationery Office. p. 110. Retrieved 15 November 2014. ^ Bingham, John (29 June 2009). "Mix-up at Royal Mint creates dateless 20p pieces worth £50". The Telegraph. Archived from the original on 2 July 2009. Retrieved 29 June 2009.